Disney Coconut digital card to invite birthday by printing it or by whatsapp. Five years have been waiting since Pixar announced that he would create a new movie inspired by the "Day of the Dead". I name as is "Day of the Dead" and not the equivalent in other countries as in Spain we call "All Saints" since the film has a cultural focus completely to the event in Mexico and that has nothing to do with the type of party that is celebrated in other places. 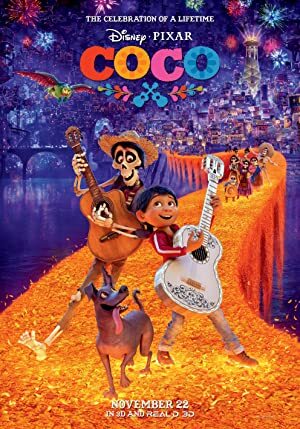 As a curious fact, Disney tried to get to the point to make clear that the film was going to go, and initially it was not going to have the name "Coco", but it wanted to record "Day of the Dead". Obviously, the Latino community quickly reacted, because Disney could not be allowed, no matter how big, to go so far as to appropriate a name belonging to a culture. 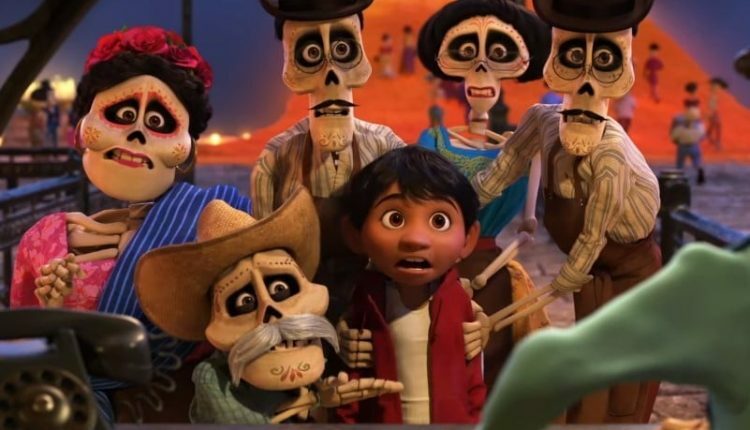 But that was only a point to forget, because we must consider this film as an achievement for Mexican culture, which in a very visual and fun way, will end up educating the little ones and initiating them. To do this, Disney has not only used images of skulls or skeletons, they traveled to Mexico to document themselves deeply, doing a great research. So we expect a lot from this movie that will surely have great acceptance, not only by our Mexican friends, but also by children and adults from all over the world who will learn (fantasy apart) what this day is for Mexico and how its people value it. as much of its folklore. A tribute to Mexico. Benjamin Bratt, Gael García Bernal and Renee Victor are some of the best known who will put the voices in the original version. Regarding the soundtrack, groups like Tierra Mojada and Mono Blanco will participate, as well as producer and musician Camilo Lara, with Michael Giacchino being the main composer. 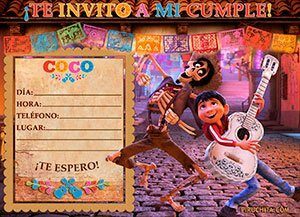 Are you going to deliver Coco invitations to the guests? 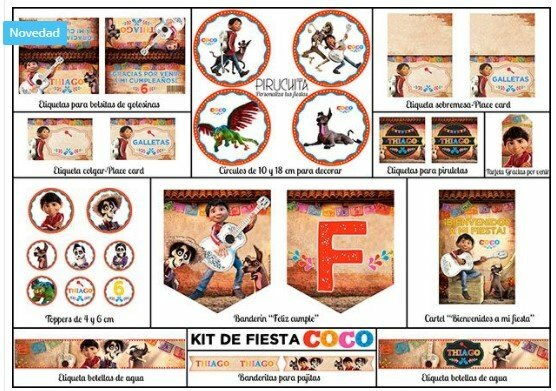 Surely expect a fully themed and personalized party with all kinds of decoration with the main characters of Coco. Look what we have for you for only 19,95 €. 100% personalized with the name and age of the birthday boy. We deliver it to you ready to print. Miguel is a young man with the dream of becoming a music legend despite the prohibition of his family. His passion will take him to enter the "Land of the Dead" to know his true family legacy. Yes ... strange, no ?. The boy protagonist is called Miguel, his dog is not white and neither is coconut, if not Dante, and the adventure friend is Hector, so who is Coco? Coco is the great-grandmother, the matriarch of the family who will connect all the stories to include several generations. Starting with the race of the mascot of our protagonist. The dog Dante is a Xoloitzcuintle, originally from Mexico, considered a symbol of death and representative of the god of the underworld Xolotl. From the 2016 have been declared heritage of the City of Mexico. There will also be abundant flowers of cempasúchil in the World of the Dead, being very used in the decoration of the tombs and altars. And as not of the Catrina. Ernesto de la Cruz is a singer inventing for this story, but is based on Jorge Negrete. This film is scheduled to be released in Mexico on October 27, could not have chosen a better day, since it is just the last Friday before the Day of the Dead. If you reside in the US you will have to be more patient and wait until November's 22. In Spain we will have to wait even longer to see her in the cinema, just the December 1. Miguel is a child of 12 years with a great passion for music, with the misfortune of living in what is probably the only family in Mexico where they ban music, something he can not understand. 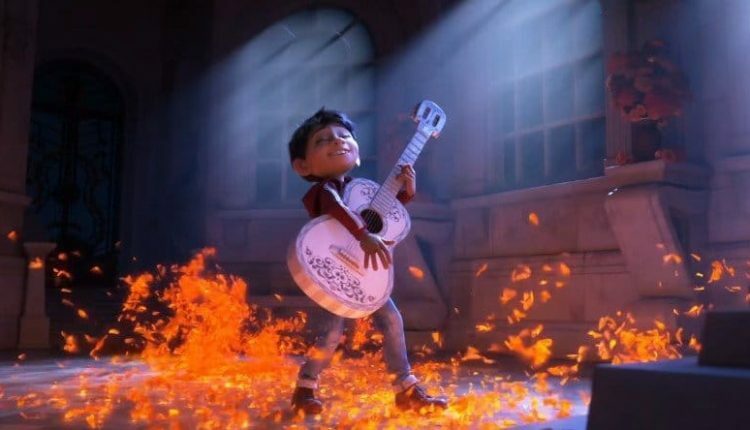 But despite the ban, Miguel needs to play the guitar, just like his idol Ernesto de la Cruz does. One day, playing in front of a tomb of a musician, magically ends in the Land of the Dead along with his dog Dante. There he will meet Hector, who will become friends with whom he will travel through this colorful world, meeting his ancestors and discovering his history. Will you understand why your family does not want you to play music? But not everything is like a vacation, you will suddenly realize that your body begins to also become a skeleton, and you will have to receive help to return to the real world before becoming completely dead. We leave this space reserved once you can see it in the cinema, for now, a preliminary score based only on what is seen in the trailers. Everything aims to be a new success of Disney · Pixar, which again bets on the Latino community, just as I had previously done with the series and film of Elena de Avalor. 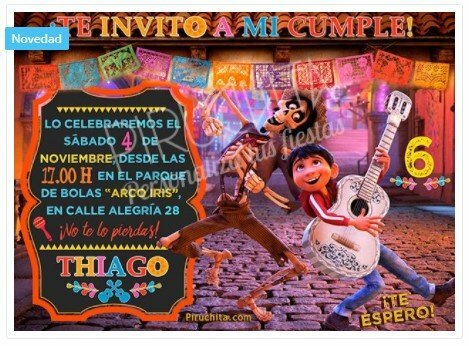 La Disney Coco's Birthday Invitation · Pixar is designed in high quality, 300 dpi, perfect for printing both at home with any type of printer, as well as in a printing or online printing service.